Celebrities seem to guzzle hot water with lemon like it’s going out of fashion. They swear it helps them lose weight and stay healthy, but is it true? Experts say yes, and when it’s combined with ginger, a metabolism-revving remedy, you can bet your bottom you’re on the way to skinnyland. Replacing any sugary, stimulating drink with a healthy one is going to cause weight loss, and you might not even notice it happening! 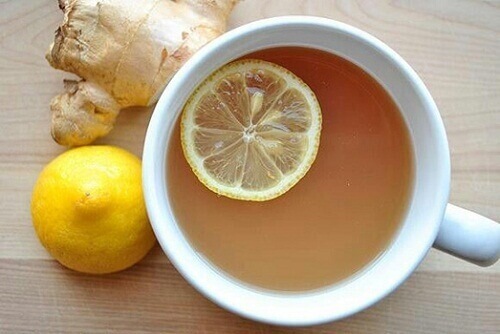 It’s possible to use lemon and ginger as extra weight loss tool for your box of tricks. The major benefit you can derive from a lemony, gingery drink is speeding up your metabolism. Keeping yourself hydrated is very important when it comes to your metabolism, and adding lemon and ginger to your plain water gives it a refreshing flavour and a warming touch you’ll really enjoy any time of day. Lemon water is a natural diuretic, so if you’re experiencing bloating or excess water weight, lemon is your friend. Lemons are full of vitamin C, and they are the most alkaline fruit, which means they help neutralise the acidic toxins and wastes in your body and help your liver cleanse them out. You might enjoy how your skin looks after a month or so of drinking lemon water, too, for this very reason. Be careful if you suffer from frequent acid reflux, though, as you may make your symptoms worse by adding in lemon. Ginger increases your “inner fire” (yes, like yoga), speeding up your metabolism and helping your body burn through food during digestion. It contains no calories, and yet it gently energises you and gives you a lovely boost when you’re on a calorie restricted regime. Studies confirm that there is a connection between weight loss and both lemon and ginger, but no-one can really work out how it all works. Regardless of this, try adding them into your routine and experience the benefits for yourself. Try out the following ideas! Breaking your fast with lemon (and a tiny bit of ginger powder or slice of fresh ginger if you’d like) will give your liver a little detoxifying nudge. This warming drink is perfect for gently getting your body going, ready for a day of high metabolism and healthy food. Fancy knocking out all the impurities like a ninja? You’ll love the “master cleanse”, created by Stanley Burroughs during the 1940s. Basically, it involves fasting on a diet of lemon juice, cayenne pepper and maple syrup for 10 days, but you could try modifying it and doing 4 days. You’ll want to research the master cleanse well before you start. It blasts through old waste and excess waste like you wouldn’t believe. Lemon and grapefruit cut right through grease. And fat is essentially grease, isn’t it? Add a teaspoon or grapefruit and lemon juice to a hot cup of water and then add some mint. Since mint and lemon are so great for your digestive system, you’ll feel relaxed and cleansed in no time with this one. Let’s face it, you probably will be tempted to pour the sugar into this one. However, take a moment to consider how great it would be without sugar. Pop in some agave if you must, or some stevia. Add all the ingredients into a big jug. Chill and/or add ice to make a refreshing afternoon drink for the whole family. Green tea contains a lot of antioxidants, and green tea and ginger make a potent Asian mix for the metabolism. Great in the morning or afternoon, you’ll be surprised by how much natural energy you seem to have when you replace your cola with this pair. Enjoy piping hot.